Long before the formal establishment of HM Coastguard, the Board of Customs collected the various duties payable on imported goods and prevented any evasion of payment by smugglers. In times of war, Preventive Officers were appointed as much to prevent the coming and going of passengers and exchange of intelligence and correspondence with France as to hinder smuggling. By the end of the seventeenth century the Board of Customs had a small fleet and a few men on the coast. During 1698, after lengthy discussion between the Board of Customs and the Treasury, the first peace-time force for ‘the guard of the coasts of Kent and Sussex’ was formally established. In 1809 the Government established a Preventive Water Guard to operate in coastal waters, to tackle any smugglers who had managed to evade the Revenue cruisers further out to sea and to check on the effective functioning of the Revenue cruisers themselves. It was also responsible for giving assistance when a ship was wrecked. In 1816 the Preventive Water Guard was placed under the control of the Treasury and all but a few of the Revenue cruisers passed to the Admiralty, while the Riding Officers remained under the Board of Customs. In the same year a new shore-based service, the Coast Blockade, was established by the Admiralty to complement the existing forces. This new service consisted initially of 92 officers and men and was stationed along the coast between the North Foreland and Dungeness to capture smugglers as they came ashore. The existence of so many different preventive services resulted in much overlapping of function and duplication of effort. In 1821 a committee set up to enquire into the operation of the Customs recommended the combination of all the preventive services (with the exception of the Coast Blockade which would remain under the Admiralty) under a single authority, the Board of Customs, though the officers of the newly amalgamated service were to be nominated by the Admiralty. The proposal was accepted, and in 1822 the Preventive Water Guard, the Revenue cruisers and the Riding Officers united to form the Coastguard. In 1831 the Coast Blockade was also absorbed into the Coastguard. These four preventive forces employed nearly 6,700 men at the time of amalgamation. In 1856, after the Crimean War – during which the Coastguard first functioned as a reserve force for the Royal Navy – control was transferred to the Admiralty. During the next 70 years the service acquired a variety of different responsibilities, ranging from those laid down in the Coastguard Service Act 1856 (to provide for the defence of the coasts of the realm, the more ready manning of the Royal Navy in the event of war or emergency, and the protection of the revenue), to assisting vessels in distress, taking charge of wrecks, operating life-saving apparatus and participating in the lifeboat service. 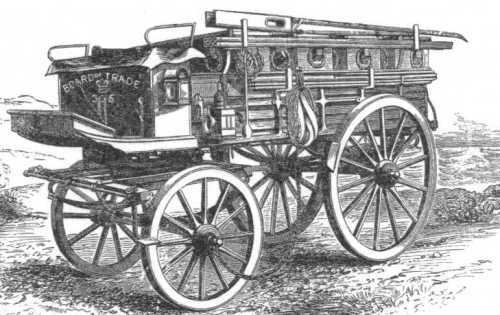 The lifesaving apparatus was an important piece of standard equipment. It carried ropes, ladders and other equipment for the rescue of people from ships close to land. The picture below shows the lifesaving apparatus and the rocket crew from the Amlwch station around 1910. 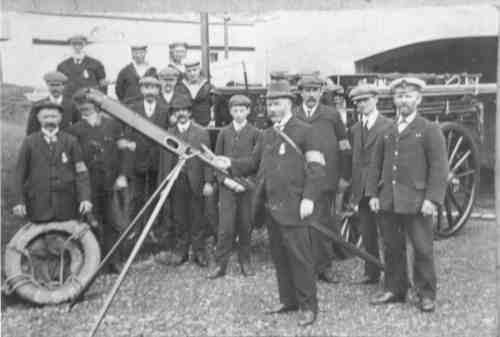 The rocket launcher in the front of the picture was used to send a rescue rope to stricken ships close to the Amlwch coast. Once a line had been connected between the ship and shore a breeches buoy rescue system could be made up and people pulled ashore. The building in which the rescue equipment was stored was known as “The rocket house” and was built by Thomas Builder in 1877. It is the building on the right of the picture below. 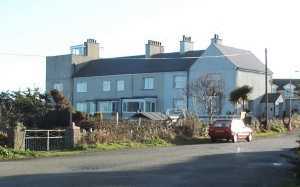 The row of buildings behind the rocket house are the coastguard cottages with the watch tower at the end. The lease for this land was given to John Thomas of Bangor on 9/8/1876 by Charles Bunt Dyer at a rent of £10 pa for 99 years. 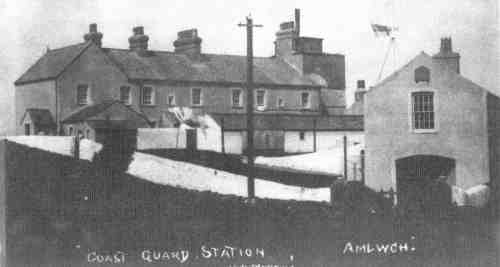 A condition of the lease was that a coastguard station consisting of “an officer’s house 3 cottages a watch room with Rocket and Cart house with proper and sufficient outbuildings should be built within two years”. The new building was completed quickly and on 31/5/1877 it was leased by the Office of the Lord High Admiral for 60 years at £115 pa. A few days earlier the SS Dakota, a steam ship from Liverpool was wrecked on a rock just below the new coast guard station. Over 530 passengers were taken off the vessel by the local coastguard, rocket apparatus and the Bull bay lifeboat. This lease was surrendered on 13/1/1927 when the station closed. All of these building are still in existence as private houses just opposite Amlwch primary school. 1856 Principal Officer John William Hughes. 1861 Officers:- William Williams, James Judge, Mary Galvin, Stephan Mannering, Glan yr afon cottages. 1866 Officers:- R Williams, W Ware.